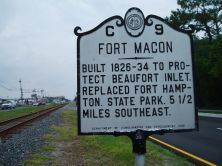 Built 1826-34 to protect Beaufort Inlet. Replaced Fort Hampton. State park. 5 1/2 miles southeast. 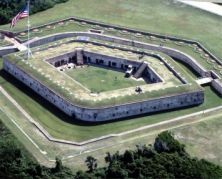 With successes in 1862 at Roanoke Island and New Bern Union commanders set their sights on Fort Macon, built between 1826 and 1834 to protect Beaufort Inlet. Garrisons had manned the facility at irregular intervals leading up to the Civil War, usually only during periods of international tension. Consequently, the masonry fort by the 1860s had begun to deteriorate. Morehead City, just across the sound, was a strategic target, being the terminus of the Atlantic and North Carolina Railroad. 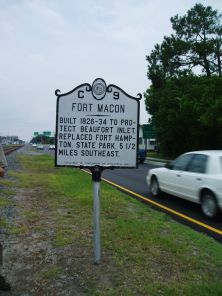 Defending the fort in mid-March 1862 was the only significant Confederate force still operating on the coast between Wilmington and Norfolk. Gen. Ambrose Burnside selected Gen. John G. Parke to capture the fort. Early on, Parke hoped but failed to compel the Confederates to surrender without resistance. He set up his headquarters in Carolina City, a village of about 100 inhabitants just outside Morehead City. Forces on both sides amassed their weapons and the siege extended over four weeks, from March 23 to April 26, 1862. Parke and the Union troops selected Hoop Pole Creek, about four miles west of the fort and directly across the sound from Carolina City, as their landing site. On April 8 the first skirmish took place between the Union landing force and the detachments from the fort. Union troops sets up artillery positions on the banks leading up to the fort from the west. It took ten days for the Federals to wear down the Confederates. In the end the rebels’ firepower was no match for the Union’s and the fort’s commander, Col. Moses J. White, posted the white flag. Given the intensity of the firing, casualties on both sides were remarkably light.